Communicate Technology PLC provides, install and maintain IT and Telecoms Services to Business Parks across the UK as well as offering cloud based services. Spearhead Interactive were commissioned to create and deliver a phase one proof of concept sales tool to promote Communicate Technology PLC; and building owners; showcase the available space; allow users to build and configure their IT service package; and link orders to internal CRM systems. Navigation around the software has been kept very simple to ensure ease of use for the user and a seamless experience across all elements of functionality. By selecting and confirming teleport points users are able to navigate to multiple areas of the environment, seamlessly. Confirmation screens ensure that the user is always aware of their selection and provides the option to return to the map or initial location if the selection was unintended or accidental. Users are able to navigate freely around the environment, using on-screen thumb-sticks to move and look around the phase one model. Currently the model is presented "grey-scale" with a medium amount of detailing, with textures, materials and additional geometry planned to be included through additional phases. 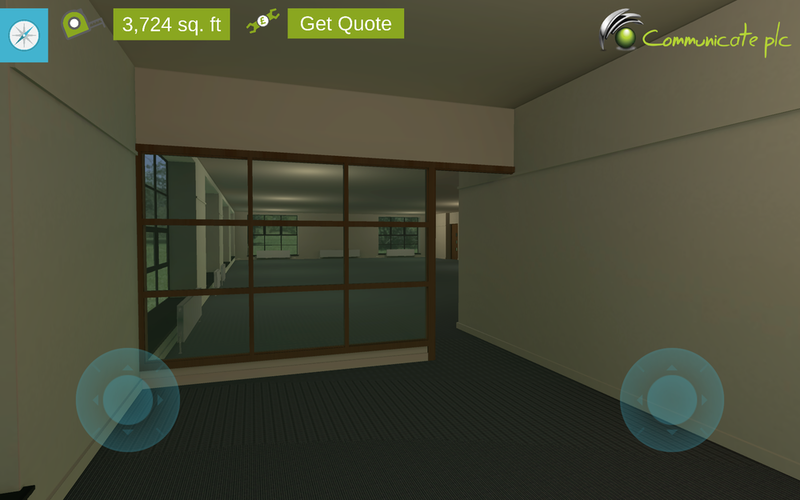 Users are able to navigate around a fully textured and furnished digital replica of the Communicate PLC offices. Outside of the primary use for the software; this element is also useful as an orientation tool for new starters; showcasing the work environment and enabling an understanding of facilities and layout prior to arriving on-site. Showcasing rental opportunities, users are able to navigate around currently unoccupied offices and attain information on the amount of available space via dedicated labels and links. Users are able to access the Communicate PLC portal directly from the environment; enabling them to set up an account, configure a bespoke IT service package, attain quotes and place an order. Located around the environment are three types of information pod, providing the user with information on the building (located on ground and first floor atriums), Communicate PLC (located within the office replica) and building owners (located within the available space).